Now that you’ve set up iMessage, if you use multiple iOS devices you’ll want to be sure to sync your conversations across them all. This is supposed to happen automatically as long as the iMessage account on each iOS device is set to the same Apple ID, but it doesn’t always do so. If your iMessages aren’t syncing, there’s a quick fix to have them reliably sync across all your devices. You’ll probably want to verify this process on each iOS device you intend to sync the iMessages to. It’s obviously necessary for you to be using the same Apple ID or iMessage account here, and this also requires iOS 5 on every device since iMessage is a feature of that OS update. Why Don’t iMessages Sync Automatically Until I Do This? They’re supposed to, and some do and some don’t. The sporadic or unreliable syncing behavior seems to be most problematic when using iMessage between an iPhone and another iOS device like an iPod touch or iPad, and presumably that is due to the Caller ID associating with a phone number rather than an Apple ID. While verifying this to be the case, I discovered that MacGasm came upon the same solution when syncing messages with an iPhone 4S, further implicating the iPhone’s phone number as the cause of the problem. I’ll bet a future iOS 5 update will fix this, but in the meantime it’s easy enough to do manually. Hi! I had a question about using iMessage across multiple devices. 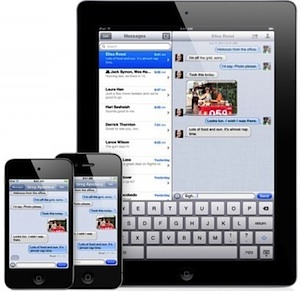 How can iMessage be made to push and sync more efficiently across multiple devices? Most of the time (read: almost every time) I must begin sending messages from iPad before incoming messages will begin getting pushed to that device. I just want it to be the case that whenever I participate in a text conversation between other iMessage users, that all my non-deleted conversations will appear on all my devices exactly as they were; regardless of which device I used previously. We hope this answers your question Jeremy, enjoy iMessage! I found that even after sync’ing the AppleID’s my messages weren’t in sync. Some Googling suggested that resetting the Network on my iPhone and iPad would get iMessage to sync up and, for me, that did work. This will cause all your WiFi passwords to be cleared so be careful. I think this is actually a bug with iCloud and not iMessage, because once I got iCloud reconfigured it worked fine and I didn’t do the Apple ID check. ‘Should’, yes. But don’t always work for everyone. Hence the suggested fix. I don’t believe this is a bug per-se… it’s just that your mobile number is only associated with your iPhone. Why would messages coming there reach your iPad in the first place? That would introduce privacy issues, for example if you sold the phone. Great tip, thanks. I came across this issue a couple of days ago and it left me scratching my head. The only Message settings I have on my iPads are iMessages, Send Read Receipts, Receive At, and Show Subject Field. My iPhone has all the many Settings for Messages. When I try to message on an iPad the Send button is grayed out. Any ideas? Thanks. You need to enter the text in the iMessage (bottom) part, not the Subject (top) part. After that, be sure there is a confirmed email associated with your iMessage section of the Settings app. If I clear texts/imessages from my phone, will they be cleared from any other devices synced to the phone? Found a further problem. I sold my old Iphone 3GS 2 months ago, and upgraded it to IOS5 and started it as a new phone before I sent it off. Whilst my daughter I message me, the lady I sold the old phone too was able to join in and I message myself and my daughter. I reported it to 02 but they just said the lady who bought my old iphone has to restore it, which I should have done before upgrading. Beware of this. Top marks. I could never work out why I had partial messages between my ipad2 and iPhone and whoever I was texting. I changed my iPhone setting as per advice and now they both track my correspondence. Finally…a great solution! Worked for me, although, I noticed that if I read the message on my iPhone, it doesn’t show up as a message on my iPad unless I go into the iMessage app to view it. I’ll give it a whirl and see how it goes. So this worked for me. but now I can’t get them to sync with my mac using the beta version of messages. Thank you, thank you, thank you! I could not figure out what the problem was & why I couldn’t send messages from my iPad. Ok – I keep seeing people want to sync their imessages – I have the opposite problem. I have an iphone 4 and an ipad 2 – and I don’t always have possession of both – IE – sometimes my kids are playing with the ipad. Sometimes I have imessage convos that are inappropriate for kiddos – how can I keep the two separate? WITHOUT disabling my apple ID? Enable airplane mode if they don’t need connectivity, or just disable all Messages notifications and hope they don’t open the Messages app. Hello, I changed my setting to my Apple ID and did get some to sync, but not all are, basically 80% are not syncing. Any ideas are appreciated. Regina I’m having the same problem. The messages map over between iphone 4 and ipad 2 for one of my contacts, but not for another one that I can send imessages too. I wonder why? I just figured it out. In order for it to activate after setting it up you have to send the message from ipad then it starts to be picked up across devices. Ben: Enable airplane mode if they don’t need connectivity, or just disable all Messages notifications and hope they don’t open the Messages app. I have a problem like Ben stated above where I don’t want the iMessage to appear on 2 devices. But I have an iPhone and my daughter has an iPod Touch and we share the same Apple account and she messages her friends and they come through as an iMessage on her iPod and then it also appears on my phone. I want us both to be able to use the iMessage feature but I don’t want to see her conversations and I don’t want her to see mine. Is there a way to fix this? We both want the iMessage feature. Barbara, did you figure out how bit you and your daughter could use iMessage? I am having se issue. You need to create a 2nd Apple ID for your daughter. That new (2nd) Apple ID will be used as the iMessage account. On your iPod Touch/iPhone, go to Settings -> Messages. If you’re already logged in (you’ll know because the top item will be a white box that says ‘iMessage’ with an on/off switch), then scroll down to ‘Receive At’. Touch ‘Receive At’, then touch the ‘Apple ID’ button at the top. You’ll see a button appear at the top that says “Use your Apple ID for iMessage”. Touch that and touch the ‘Create New Account’ button at the bottom. Go through the steps to create a new Apple ID. Sal – I am with Barbara. I have 3 boys all with itouches. We have a family Ipad. They all do not want to recieve each others messages with friends. I would like to have just one Apple ID for the family. Is it not possible? From what you said above, I have to have each itouch on a different Apple ID? What will that do with itunes account? Will they be able to share games, music, etc? I have an iPhone and an iPod touch both with the required software. Can I send a iMessage from my iPhone to my wife on the iPod touch? My mom’s iPhone, my iPhone and my iPad had the is using the same apple id account. Whenever i sent a iMessage from my iPhone. It also appears in my iPad. Does it also appear to my mom’s iPhone? Thank you for the information! It worked like a charm. The missing piece for me was, even after setting this up as described, if I had existing conversations that used just the phone number, they would continue to go there. Not sure if @mac.com & @me.com were being treated differently or not. I have an iphone with my own apple id and my daughter has an itouch with her own apple id. Am I able to set imessages syncing so I get my messages AND all of her messages sent to my phone, without having any of my messages sent to hers?? (one of the conditions if she wanted to keep her itouch..) Would I just add her apple id and password on my phone?? Will I then get messages for both accounts? But she would only get her messages still, like normal, but would NOT be getting any of mine, correct?? Please explain how I would set that up. Am I crazy or is there no “Caller ID” setting on the iPad? I’ve set up everything else as per the author’s instructions, but still having the same issue. Seems i can send off of my ipad but i can not recieve, and my iphone 4’s messages do not sync with the ipad, i tried all solutions listed but same problem! How do i fix this? I’m not sure if someone posted this above, however I had major issues syncing all my devices (iPhone 5, Mac Book Pro with Retina, and iPad 3) to iMessage as well and searched all the forums and every solution had not worked. So I wanted to post what worked for me. I found that when I set up iMessage on all my devices, the message would only come through on two of the devices depending on which device I sent the original message. So I turned off iMessage from all devices, shut down all devices, and then started with my iPhone first. I set up iMessage on the iPhone (I removed the e-mail options just because I was having issues with my phone number not showing up on the other devices). Once on my phone, I set up iMessages on my Mac Book (same thing, left out the e-mail). Then went to my iPad. I will note that my phone number did not show up on my iPad right away, but after turning it off and on a couple of times it showed up. Volia, my messages shows on all three devices. Hope this helps someone! I have two iPhones both 5s one is for my personal use and the other for work. But I want to sync imassages on both phones. Please anyone tell me how to figure this out. I have a few iPhones with iMessage synced but no iMassage. How can I get an iMassage? Can I iMessage someone to order an iMassage? If I sync iMessage to a massager will they do the job? Please tell me how! I recently bought an iPhone 5 and want to sell my old iPod touch. I want to retrieve all of my iMessages from my iPod into my iPhone but it’s not working. I tried going to my settings and finding the “retrieve at” and “caller id” but neither are there. I just want to have all of my pictures and messages transferred from my iPod to my iPhone. Help! I have an iMac + iPad + iPhone. All synchs (mail and notes) but Phone will NOT synch. On the iMac + iPad + iPhone of my friend all is set the same and all items synch.